There is a lot of fiery energy in the air. Let’s take deep breaths, slow down and take time to reflect internally and open our hearts and perceptions as we continue this ongoing process of personal and collective evolution. We are still under the influence of Saturday’s New Moon in Pisces, which is all about healing and addressing the spaces that have been stirring deep pain for us. It is divine arrangement that just at this time, a new light has been shed on an important topic such as big business yoga and the heart of the yogic path. You may have heard that recently, international yoga teacher Kino MacGregor wrote an article on Elephant Journal, where she expressed her pain in seeing profits put before people, especially when this is done in the heart of a supposedly yogic community. 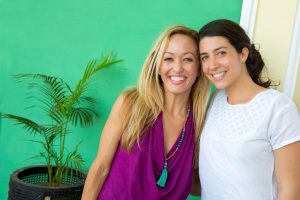 Kino’s friend and colleague, thought-leader Dana Falsetti has been sued for defamation for sharing her opinion over a high profile yoga clothing company of questionable ethics and integrity and very exclusionary marketing campaign. I believe it is an important message for today’s modern yoga world. While I myself have a yoga related business and have nothing against earning money, I do stand tall on my core values and my hope is that you feel it too. I know that by staying anchored in providing creations from the heart, making sure materials are responsibly sourced and sustainable, supporting ALL women and keeping operations fair and transparent, I can feel good about what I do for the world and the yoga community. If you are not the living embodiment of your mission and not truthfully living what you stand for and promote, your actions won’t reflect what you are saying and emanating. Kino is wearing our Lakshmi Dress and Speak Your Truth mala. And people bs detectors will start to go off. Your vibe affects your tribe. And we in the yoga community want to be around positive, healing and supportive vibes! Stay in alignment to your truest and deepest core values. Demand quality and integrity not only in the products you buy, but also in the lives of the people who made it come to life. You have A LOT of power as a consumer! Choose wisely. To help create a world where people cannot be sued for thinking critically and speaking up, I choose to support Dana’s cause. In this effort, by purchasing Andara Stars, you are also donating to Dana’s GoFundMe page so she can defend herself against this huge corporate lawsuit. We are donating 30% of this week’s sales to this cause. If you have been thinking of purchasing that special piece you liked from our collection, THIS is the time to do it and also support justice in the community we care so much about and are part of. I honor your choice of being part of this super good vibe tribe where we cultivate mutual love and support to all. May all women walk in beauty.